Astarin's Tuned Wind Chimes is well worth the cost if you want a sweet and calming,beautiful amazing grace wind chimes by garden. Every time the wind blows, you can image light and delightful notes spreading through a wide forest. In addition, featuring super-thick-walled aluminum tubes, this musical wind chimes resonates much longer than others, bringing enduring musical beauty. The package will give you an extra postcard, and you can write what you want to say on it, as a memorial gift send to your friends or family. Astarin is Professional wind chimes manufacture since 1929. We stand by everything we sell, If for any reason you are not completely satisfied with our products Just Contact us Any Time, We will make it right. We sincerely hope that you can enjoy your shopping. The happiness of wind chimes can't be hide, have the joy of wind chimes! ♪ Large Tuned wind chimes outdoor total hanging length is 36"with a stronger hook,the longest tube is 16". 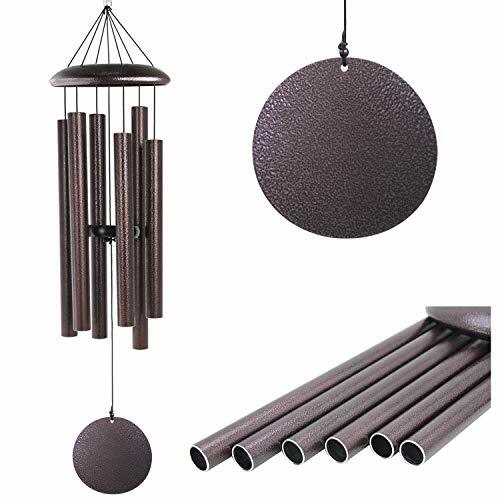 6 aluminum powder-coated tubes,every metal tube of this large wind chime is hand-tuned by our professional tuning experts to achieve a superior musical performance.Heavy duty nylon cording high density striker for a clear tone and resonances.The sound is soft,deep tone and relaxing .You can feel the sweet sounds of nature. ♪ Amazing Grace is one of the most popular tuning.Many wind chimes disappoint. Others irritate. Astarin's amazing Grace wind chimes are delightful thanks to expert tuning. Enjoy peaceful melodies that play as a whisper in the wind - deep tone, rich and full of beauty. They sound lovely so get Astarin's amazing grace wind chimes today. ♪ The metal wind chimes is made entirely of aluminum ,not only the six tubes ,also the hook,the top part and the wind chimes pendulum,all durable anodized bronze finish.Thick tubing wall creates a longer lasting deep tone.Each tube is precision tuned to pentatonic scale. ♪ The copper vein finish is dark brown finish with veins of black. It's reflective surface shines well in the light. Wonderful in any sunlit area of your home.The personalized wind chimes deliver soft deep tone.And the adjustable bell length makes the sound of different scales.It is personalized wind chimes and amazing grace wind chimes. ♪ Musical tuned wind chimes has a wonderful low tone, perfect as a memorial, decorative keepsake, dedication or birthday greeting .Beautifully finished, provides years of pleasure in a garden .These memorial wind chimes make a great gift for all occasions. If you have any questions about this product by Astarin, contact us by completing and submitting the form below. If you are looking for a specif part number, please include it with your message.